Going away to college is like a practice run in real adulthood — and the freedom to decorate your dorm room is a huge step in defining the next phase of your life. But the realization that your home for the next nine months is nothing but a tiny, whitewashed, badly lit cement box can dramatically lessen the excitement of moving into the dorms. The thing is, your space can have a big influence on who you are as a person. And do you really want that person to be bland, bare and depressing? Since then, and without the false sense of security financial aid brings, I’ve learned how to spruce up my space on a budget — and with dorm- and rental-friendly decor. Below, you’ll find the ultimate guide to dorm room decorating on a do-it-yourself dime. To help you get started, here are 24 DIY dorm decorating ideas to outfit your new place in style. Take advantage of your free printing privileges at the library to print and hang free art you find on sites like Etsy. Creating this gallery-style wall couldn’t be easier (or cuter). Simply mount command hooks to the wall, hang binder clips from the command hooks, and clip in photos, art, letters from home — whatever makes you happy! Another way to hang your pictures is with washi tape. It holds pretty well, but it’s low tack, so it’s easy to remove at the end of the year. Hang your photos by taping a frame around the edges — mix and match colors, patterns and frame designs to keep your gallery wall interesting. All you need is a roll of washi tape, a little bit of math and a lot of imagination. Try making a larger-than-life pattern on the wall or door, or cover your ugly dorm furniture in colorful stripes — with washi tape, if you can dream it, you can do it. Wall decals and temporary wallpaper can be a fun and cute way to decorate your walls when you’re not allowed to paint — but they don’t come cheap. Instead of buying expensive stickers that will just end up in the trash at the end of the semester, try making your own: Cut shapes out of scrap paper (like from the way-too-many flyers you collected during welcome week) and stick them on the wall with double-sided tape. This cute confetti wall makes every day feel like a party! DIY string art is easier than it looks. Learn how to make a super-simple (and dorm-friendly) version at HelloBee. Once you have the technique down, the possibilities are endless: Outline your home state, a flower, your initials or a fun phrase! You’ll need a cork board for hanging your college memories anyway, so why not have some fun with it? You can find cork sheets in all shapes and sizes online — all you have to do is paint them and hang them in a funky pattern like this one from Julep at Minted. Done and done! Possibly the easiest DIY you’ll ever try. Cut different shapes out of felt, then use hot glue to attach them to a piece of yarn. So little effort for such cute results! Probably my favorite project on this list and something I loved trying for myself. Plus, these things are popping up everywhere, so they’re totally on trend. I (loosely) followed this tutorial from Oleander and Palm. But that’s the beauty of this project: It’s so customizable! Throw pillows are the easiest way to spruce up a bed or add flair to a futon. Buy linens or fabric scraps from a thrift store or the Walmart dollar-fabric section, then follow this tutorial from Homey Oh My for no-sew pillow cases. Bonus tip: If you can’t find a pattern you like, you can paint a custom design on plain fabric using a multisurface craft paint. Whether you keep it in the hallway or right inside your door, a personalized doormat can be your hallmates’ first impression and a place for your friends to kick off all the grime from walking around campus so they don’t track it into your living space. Find out how to make your own by following this tutorial over at Amber Interiors. Dorm rooms usually have cold (and not so cute) vinyl tile, so it’s nice to have a cushy place to land in the mornings. But rugs can be expensive! Save money by stitching together smaller versions of large area rugs — a few small rugs are almost always cheaper than one large one. You can also consider an outdoor patio rug. They’re not as soft, but they’re cheaper, more durable and hold up well against spills — all big bonuses for a rug that’s going to see so much traffic throughout the year. This is a great way to make sure your dishes don’t get mixed up with your roommate’s. You guys might share just about everything, but germs from a dish mix-up shouldn’t be one of them — you’re in close enough quarters as is. Try this tutorial by Living Well Spending Less, and have fun by changing up your designs! Pets are usually against dorm policy, but sometimes it’s nice to have something to take care of. So rather than shoving your cat in the bathroom every time the RA wants to pop in (I might have done this a few times), try taking care of a plant instead. Hardy plants like cactuses and succulents are pretty impossible to kill, and they look adorable in a cute, painted pot. Use this technique from Brit + Co to decorate a planter for your little friend. So many textbooks, so little storage space. Enter: bookends. But don’t just run out and drop big bucks on the first ones you see. (Why are bookends so pricy?) Instead, make them yourself for under $5. How cute are these dog bookends from HGTV?! And then put them on everything. Seriously. They’re so easy to make and look cute everywhere. String them on a garland, or use a needle and thread to attach them to a pillow or throw blanket. Or hot glue them to a piece of posterboard to create a showstopping wall-hanging like this one from Sugar & Cloth. Just substitute cardboard for the wooden plaque to make sure it’s lightweight enough to hang without nails. 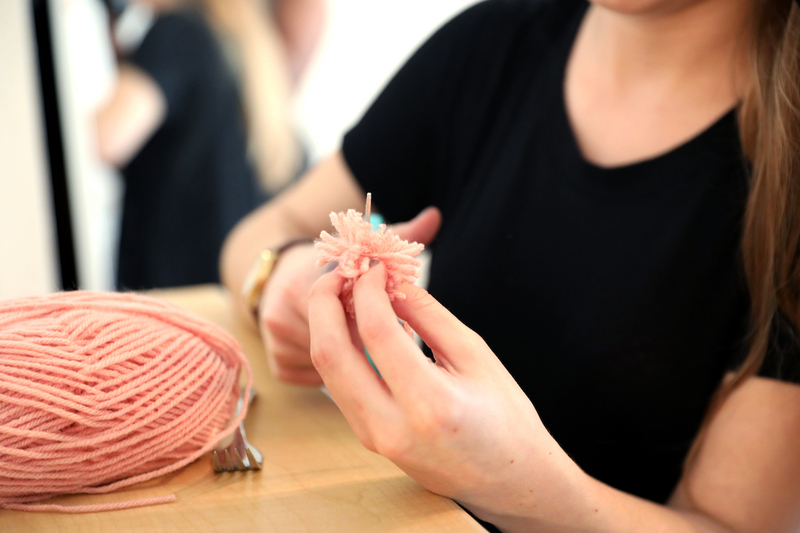 Here’s a tutorial from Handimania for two different sized pompoms to get you started! I wish I had known about this when I was living in the dorms. A headboard immediately takes your space from depressing dorm to hotel chic. Here’s a super-simple tutorial from Stars for Streetlights using things you might even have lying around. It’s light enough to mount with command strips, too! Seating options in dorm rooms are limited, and your friends usually end up eating pizza on the floor. Remedy the situation by giving thrifted folding chairs a DIY makeover. The process is super simple, plus the chairs fold flat for easy storage. Follow this tutorial from Design for Mankind: Use any fabric and paint combination you want! You could also keep a stash of cushions handy for guests to lounge on. Find cheap pillows and cushions from the clearance section at stores like T.J.Maxx and HomeGoods, and cover them using this tutorial from The Kitchen and the Cave. Never forget a due date again! Just take a picture frame (dollar store or thrift store frames are perfect for this), and insert a pretty background or a calendar template to make a DIY whiteboard calendar! Hang curtains with a tension rod stretched between the window sill. If the window-and-blinds situation doesn’t allow for a tension rod, get handy and mount command hooks first, then stretch the curtain rod across the hooks. Maximize your limited closet space by hooking shower curtain rings on a clothes hanger for easy and convenient storage of belts and scarves. Easy peasy (and pretty much free! ): Walk outside, find stick, hang on wall. OK, so there’s a little more to it than that. But still, it looks way fancier and more time-consuming than it is. Follow this tutorial from Mojomade for your own one-of-a-kind jewelry holder. Use pretty paper to cover old cans, tins and jars for a super-cute way to keep your desk supplies organized — like these from Better Homes & Gardens. Most importantly, have fun with it! Your room should be a reflection of you — use these tips as a jumping off point to create a unique and interesting space that makes you feel good. There’s only one rule: Don’t let someone with a very different personal style dictate what surrounds you day in and day out. Trust me — I spent a whole year in a prison of turquoise and burlap, and it was, well, not my thing. As much as living with a roommate is about learning to compromise, college is about eking out your own personal style, regardless of what other people are doing. And finding that personal style on a budget? Your Turn: Will you try any of these projects to spruce up your dorm or apartment? Grace Schweizer is a junior writer at The Penny Hoarder. She’s finally in an apartment that lets her put real nails in the wall — movin’ on up!